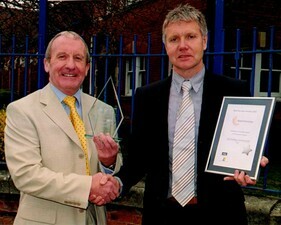 In 2005 RJH Building Construction Ltd. was awarded "Employer of the Year" for APPRENTICESHIPS in the 10-49 employees category of the Real Success Awards sponsored by Leicestershire Training Providers Limited. 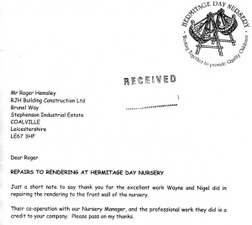 Just a short note to say thank you for the excellent work Wayne and Nigel did in repairing the rendering to the front wall of the nursery. Their co-operation with our Nursery Manager, and the professional work they did is a credit to your company. Please pass on my thanks." Now that the dust has settled (literally!) 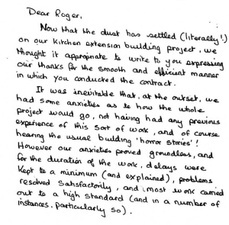 on our kitchen extension building project, we thought it appropriate to write to you expressing our thanks for the smooth and efficient manner in which you conducted the contract. It was inevitable that, at the outset, we had some anxieties as to how the whole project would go, not having had any previous experience of this sort of work, and of course hearing the usual building 'horror stories'. However our anxieties proved groundless, and for the duration of the work, delays were kept to a minimum (and explained), problems resolved satisfactorily, and most work carried out to a high standard (and in a number of instances, particularly so)."